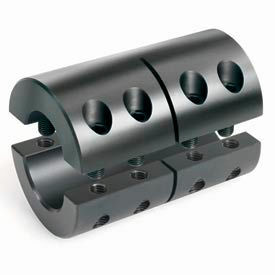 MasterDrive® Jaw Coupling Inserts Come In Four Styles, For Use In A Variety of Power & Transmission Applications. 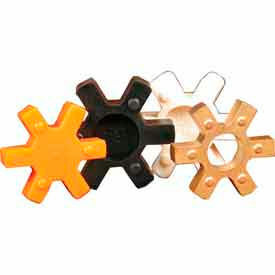 >Black Buna - NBR is the most Economic and has good oil resistance, Orange - Urethane provides better torque capacity than Buna-N with good resistance to oil and chemicals, White - Hytrel provides even better torque capacity and excellent resistance to oil & chemicals and Bronze, designed for high torque loads running at slow speeds. Recessed screw head provides an outside surface free of major projections for safety. Easily installed where major disassembly would otherwise be required. 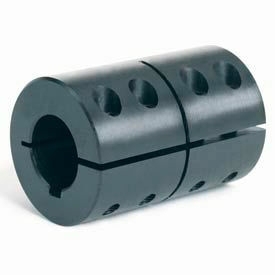 Bore Sizes 1/2" x 1/2" to 2-1/4" x 2-1/4" in Black Oxide Steel. High axial load and torque capacity - does not mar the shaft. Available with or without keyway. 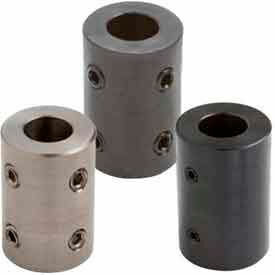 Bore Sizes 1/4" x 1/4" to 1-1/2" x 1-1/2" in Stainless Steel and Black xide Steel. High axial load and torque capacity - Does not mar the shaft. Available with or without keyway. Bore Sizes 6mm x 6mm to 50mm x 50mm in Black Oxide Steel. Recessed screw head provides an outside surface free of major projections for safety. Does not mar the shaft. Available with or without keyway. 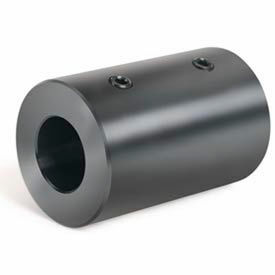 Bore Sizes 1/4" x 1/4" to 2" x 2" in Black Oxide Steel. High axial load and torque capacity. Does not mar the shaft. Pilot Bore Sizes 1/4" to 2" in Stainless Steel and Black Oxide Steel. High axial load and torque capacity - Does not mar the shaft. Available with or without keyway. Bore Sizes 6mm c 6mm to 50mm x 50mm in Stainless Steel and Black Oxide Steel. Traditional cost effective rigid coupling design. Provides torque transmission and alignment. Bore Sizes 1/4" to 2". Lengths from 3/4" to 4-1/2" in Aluminum, Stainless Steel and Black Oxide Steel. These unique two-piece rigid clamping couplings come with an undersized ID which allows you room to re-bore the ID without damaging the clamp screws. The pilot bore can be opened safely to the nominal ID reflected in the part number. Bore Sizes 1/4" to 1", Max Bore Sizes 3/4" to 2" in Stainless Steel and Black Oxide Steel. 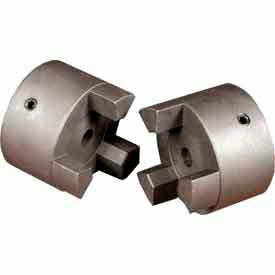 Set Screw Coupling, 1 3/8 " bore, 2 1/2 " outside diameter. Black Oxide Plated Steel Set Screw Coupling. Traditional cost effective rigid coupling design. Provides torque transmission & alignment. 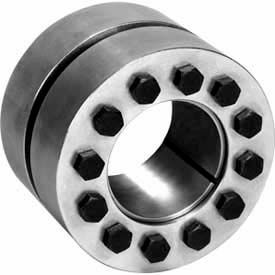 One-Piece Clamping Coupling, 1" bore, 1-3/4" outside diameter. Black Oxide Steel One-Piece Industry Standard Clamping Coupling with Keyway. High axial load & torque capacity. Does not mar the shaft. 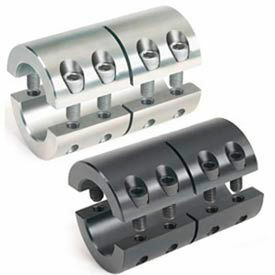 Two-Piece Clamping Couplings Hold The Industry Standard For High Axial Load And Torque Capacity. Two-Piece Clamping Couplings are crafted from Stainless Steel and Black Steel Oxide for long lasting durability. Bore sizes range from ¼" to 2" with outside diameters of 11/16" to 3 3/8" Special design does not mar the shaft. Black Steel Oxide is also available with Keyway. 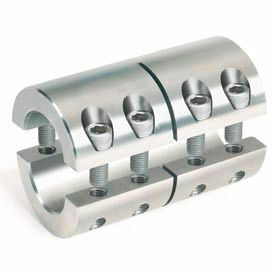 Stainless Steel Metric Set Screw Coupling. Traditional cost effective Rigid coupling design. Provides torque transmission & alignment. Climax Metal Keyless Rigid Couplings, Fractional, C600 Series Are Used For Use With Torque-Arm Mounted Hydraulic Drives With High Torque And Bending Capacities. Climax Metal Keyless Rigid Couplings, Fractional, C600 Series are solidly made for long lasting durability and dependability. 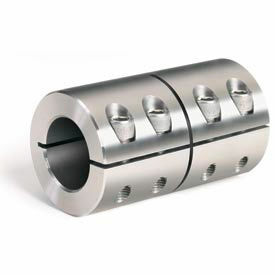 Cost effective shaft-to-shaft keyless coupling. High torque and bending moment capacity. Preferred solution for torque-arm mounted hydraulic drives. 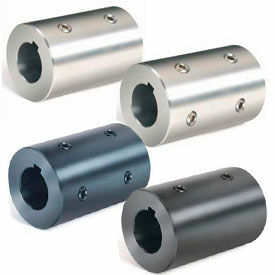 Wide selection of C600 Series rigid couplings are available in 5/8 to 4-1/4 inch shaft lengths and 3, 5, 7, 8, 10, 12 or 15 quantity M6 X 30, M6 X 35, M6 X 40, M8 X 45, M8 X 50, M10 X 65, M12 X 80 and M12 X 90 locking screw sizes. Climax Metal Keyless Rigid Couplings, Metric, C600 Series Are Used For Use With Torque-Arm Mounted Hydraulic Drives With High Torque And Bending Capacities. Climax Metal Keyless Rigid Couplings, Metric, C600 Series are solidly made for long lasting durability and dependability. 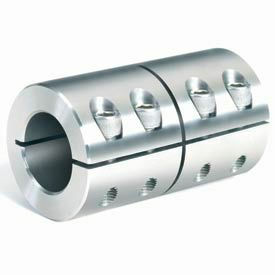 Cost effective shaft-to-shaft keyless coupling. High torque and bending moment capacity. Preferred solution for torque-arm mounted hydraulic drives. 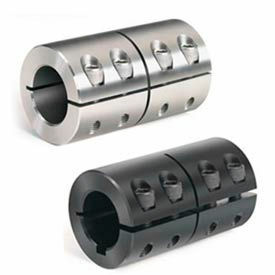 Wide selection of C600 Series rigid couplings are available in 6 to 110 mm shaft lengths and 3, 4, 5, 7, 8, 10, 12 or 15 quantity, various number M5, M6, M8, M10 and M12 locking screw sizes.